Bill Darlison: Roads for Travelling Souls: What if Jesus had been a Follower of Ayn Rand? What if Jesus had been a Follower of Ayn Rand? I’ve been reading Charles Dickens all this year. To celebrate the bicentenary of his birth in 1812, I determined to read all his novels, in the order in which they were written, starting with The Pickwick Papers, which he wrote in 1836 – when he was 24 – and ending with The Mystery of Edwin Drood, which he left unfinished at his death in 1870, aged 58. I finished Bleak House a few weeks ago, but rather than continue with Hard Times, the next in sequence, I decided to have a break and read something by Ayn Rand, the Russian-American novelist and philosopher, whose name seems to be appearing all over the place at the moment, principally because Paul Ryan, Mitt Romney’s running mate in the forthcoming presidential election, has claimed that Ayn Rand is one of his sources of inspiration. Ayn Rand was born in St. Petersburg, Russia, in 1905, and died in 1982. She called her philosophical system Objectivism, and wrote an essay called The Virtues of Selfishness, which, in a sense, tells you everything about her that you need to know. Her most famous novel is Atlas Shrugged, which she wrote in 1957. It was this novel that I decided to read since, I was informed, it presents a comprehensive account of her philosophical ideas in fictional form. At nearly 1200 pages, one needs the strength of Atlas to carry it around. In length it is very like Dickens. But that is where the similarity ends. In every other way, the two authors are diametrically opposed. Dickens was invariably on the side of the poor and dispossessed, extolling the virtues of simplicity and kindness and aiming his barbs at the rich and powerful. By contrast, Ayn Rand lionises the wealthy and successful, holding in contempt all those who depend upon the state for their livelihood, a whole class of people she refers to, dismissively, as ‘moochers’. Dickens presents a great array of characters, colourfully and entertainingly described in all their physical and psychological variety, and even his villains – like Quilp in The Old Curiosity Shop – seem to have some redeeming features. Ayn Rand’s characters are flat by comparison. Her heroes are go-getters, empire builders, men (and they are usually men), who measure their success by the amount of money they make. Her villains are everyone else. Her villains, in fact, are the kind of people that other authors would praise, and it comes as quite a shock to the reader to find his cherished ideals held up to ridicule. Consider, for example, this little exchange between a certain Mr Lawson and Dagny Taggart, one of the novel’s principal characters (unusually, a woman). Working for the common good, having a social conscience, being inspired by such ideals as fairness and equality, are signs of weakness and inferiority. For Ayn Rand, the only worthwhile motive anyone can have is profit, individual profit. This motive alone, she says, has transformed the world, brought inanimate nature under control, given us all the privilege of living with some measure of dignity and freedom. Those who have worked for their own profit are the real heroes of the human race, its real saints. The novel describes the chaos that would ensure were the great industrialists and entrepreneurs, whose enterprise has been stifled by high taxation and socialist bureaucracy, to withdraw their efforts, to disappear from the scene. Atlas shrugged – the man who holds up the world has had enough. Let the ‘moochers’, the socialists, the liberals, the trade unionists, the Unitarians, get on with it. See what happens then. 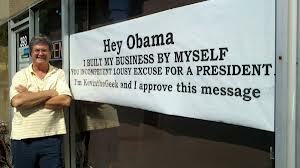 A few weeks ago, President Obama was criticised for saying that no business was ever created by just one person. Some American businessmen were incensed, and a photograph appeared on the Internet of a group of men carrying placards which read, ‘I created my business myself’ or ‘I did it myself’. Ironically, it appeared during the Olympic Games, when every victorious athlete, without exception, was declaring, in their post-event interview, that their success would not have been possible without the aid of their coaches, their teachers, their parents, their siblings, their spouses, their training partners and even, at times, their opponents. Incidentally, the opening ceremony of the Olympics featured an appearance by Tim Berners Lee, the inventor of the Internet, who could have become the richest man who ever lived, had even a modest charge been made every time his invention was used. Instead, he chose not to profit from it. ‘This is for everyone’ he typed onto the giant screen in the Olympic stadium. Ayn Rand would have despised him. By the way, Tim Berners Lee is a Unitarian Universalist. The day was drawing to a close, and the twelve apostles came to Jesus and said, “Send the crowd away, so that they may go into the surrounding villages and countryside, to lodge and get provisions; for we are here in a deserted place.” 2 But Jesus said to them, “Why not give them something to eat?” They said, “We have no more than five loaves and two fish—unless we are to go and buy food for all these people.” 3 For there were about five thousand men. And Jesus said to his disciples, “You know what? You’re right. Don’t waste your time and shekels. It would be positively immoral for you to spend any of your hard-earned money for these people. They knew full well that they were coming to a deserted place, and should have relied on themselves and brought more food. As far as I’m concerned, it’s every five thousand men for themselves.” 4. The disciples were astonished by this teaching. “But Lord,” said Thomas. “The crowd will surely go hungry.” Jesus was amazed at his hard-headedness. “That’s not my problem, Thomas. Better that their stomachs are empty than they become overly dependent on someone in authority to provide loaves and fishes for them on a regular basis. Where will it end? Will I have to feed them everyday?” “No, Lord,” said Thomas, “Just today. When they are without food. After they have eaten their fill, they will be healthy, and so better able to listen to your word and learn from you.” Jesus was grieved at Thomas’s answer. Jesus answered, “It is written: There’s no such thing as a free lunch.” So taking the five loaves and the two fish, he looked up to heaven, and took one loaf and one fish for himself, and gave the rest to the twelve, based on their previously agreed-upon contractual per diem. But he distributed none to the crowd, because they needed to be taught a lesson. So Jesus ate and he was satisfied. The disciples somewhat less so. “Delicious,” said Jesus. What was left over was gathered up and saved for Jesus, should he grow hungry in a few hours. The very poorly prepared crowd soon dispersed. So, Paul Ryan has a bit of intellectual juggling to do before the election in November. He’s already tried to distance himself from Ayn Rand by saying that he is inspired by her economic principles rather than her social teachings, and no doubt there is more back-pedalling to come. It will be interesting to see how he can square his free-market economics with Jesus’s teaching that we cannot serve God and money; we can love one or the other, but not both at the same time. ‘What doth it profit a man if he gain the whole world and suffer the loss of his soul?’ is not a question that would have troubled Ayn Rand; but it must surely trouble Paul Ryan. I don’t want to give the impression that Ayn Rand is a poor writer. Atlas Shrugged has its flaws. It is too long for a start, and it could have benefited from some serious editing. George Orwell’s Animal Farm provides a critique of society which is probably only one fifteenth the length of Atlas Shrugged, and is all the more memorable and effective as a consequence. In addition, Atlas Shrugged contains lengthy passages in which the author’s philosophy is put into the mouths of her characters, a tiresome and somewhat unimaginative method of making a point. It’s impossible to believe, for example, that someone would stand in a group at a wedding reception and speak fluently for at least half an hour on how the words ‘to make money’ hold the essence of human morality (page 414 and following!). People generally have better things to do at wedding receptions than stand and listen to lectures on economics. Her work also reminded me at times how I felt when Morag and I were driving through the beautiful but rugged terrain of New Zealand’s South Island last November. We marvelled at the courage and expertise of the men who had travelled for months on rickety ships through dangerous seas, blasted roads through rock, cleared jungle, planted crops, built houses on mountainsides. As Ayn Rand says, these things were wrought ‘by the power of a living mind – the power of thought and choice and purpose’ (page 241), and no one can argue with that. I, who cannot even put up a bookshelf – felt my own inadequacy and ineptitude. I would never have made a pioneer, an entrepreneur. My talents, such as they are, lie in other directions. And this is just my point – the simple, obvious point that Ayn Rand and those who think like her seem to forget: that we are all different; there is not just one template for the human being. We are various, and while the intrepid explorers and risk takers are vitally necessary, there’s room for the rest of us – the ‘moochers’, the daydreamers, the poets, the music-makers, and even the physically inept. I am more and more convinced that our problems are in no small part caused by people who want to build a world which accommodates just one type of human being. The science fiction writer, Kurt Vonnegut (also a Unitarian), said that when he was in college in the 1930s they were teaching that we humans are all basically the same, with just a few cosmetic differences brought about by environmental factors. They are probably still teaching the same stuff today, Vonnegut said. Whether the universities are teaching it or not, it seems to be a commonly held belief. But the Bible tells a different story. The Twelve Tribes of Israel, whatever their historical reality, are a metaphor for intrinsic differences among human beings, differences which constitute the remarkable and beautiful variety of human experience. It’s where the light gets in. The crack is where the light gets in. Recognising our individual weaknesses is the first stage of human maturity. St. Paul knew it, which is why he said, ‘In my weakness I am strong’. The English poet John Donne knew it, which is why he told us, ‘no man is an island entire unto himself’. And Dickens knew it, which is why he could depict and celebrate the great range and variety of physical and psychological characteristics among human beings, with all our foibles, follies, and failings. And Dickens did it with humour, which Ayn Rand couldn’t do. I never laughed once in nearly 1200 pages. There’s something seriously defective in any attempt to explain or depict human life which can’t even prompt a smile. It will be a sad day for the world if the disciples of this humourless woman gain any real political power. Great stuff Bill, thank you. Glad you managed to get through the book in the end, I know it was a real struggle. Thanks once again for your company at Hucklow. The whole week left a wonderful impression on me, as I think it did you too. "There’s something seriously defective in any attempt to explain or depict human life which can’t even prompt a smile." "It will be a sad day for the world if the disciples of this humourless woman gain any real political power." What makes you think that a good number of Ayn Rand disciples don't already have a fair bit of real political power Bill? Do you think that Paul Ryan has no real political power? Try again. I loved this article Bill. Never read Ayn Rand and certainly won't now. Hard Times is probably my favourite Dickens and must dig it out again. May God saves the umanity from objectivism..
Hi Bill, I call myself 'libertarian' but I am NO follower of Ayn Rand. I'm no follower of Obama either, by the way, but I agree with him when he says that no business was ever created by one person. I'm libertarian because I oppose the rise of the bureaucratic police state, the greatest historical process going on right now all across the world. Democracy has become a joke; 'legislatures' have become rubber-stamp institutions, passing into law decisions taken by anonymous unelected groups meeting in secret and the 'two-party' system has become a one-party system as party leaders openly work together. The Police State is any country where the people live under the surveillance and control of unelected officials.